Imagine handing out several business cards and pencils. The chosen spectators are now asked to secretly jot down any four digit number. For example, the year of their birth or the last four digits of their telephone number. through a small slot by each spectator. The box is shaken mixing the sealed business cards inside. and remove anyone of the folded business cards. and then to concentrate on the four digit number written inside. writes them down, unseen on a large pad. The spectator is asked to call out the numbers on the selected card. identical to the ones called out by the spectator. 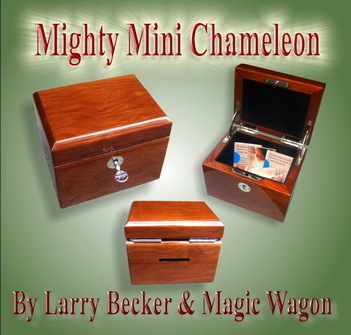 Mighty Mini Chameleon is capable of numerous effects and routines. Everything from design duplication to Q&A. exterior of Mighty Mini Chameleon can be viewed by the spectators. mirror like finish and gleaming stainless hardware with recessed hinges. Limited Edition Only 50 Available Worldwide. Manufactured in 2010 by Magic Wagon Thailand.